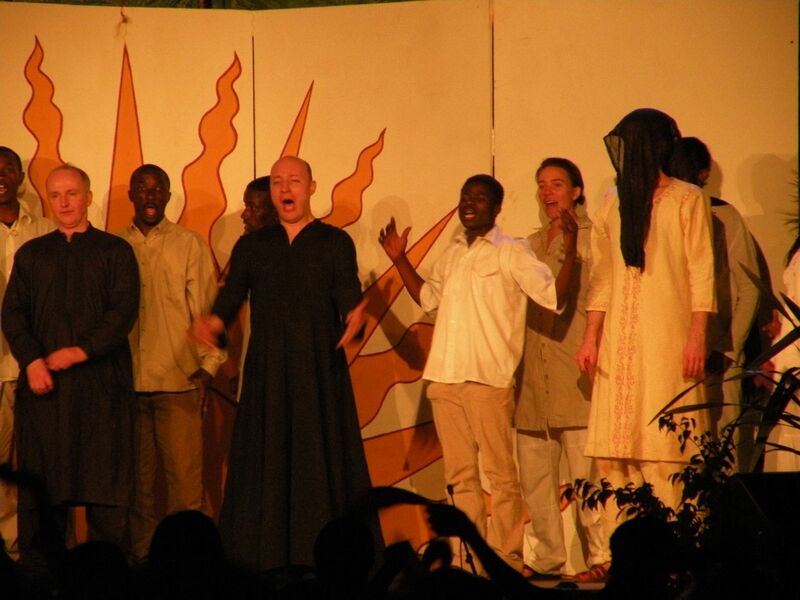 Since about November of last year, I have been singing with a small community chamber choir here in Nairobi. The group usually specializes in African and African-American choral music. This spring however, the director was asked if the chorus would be willing to be the opera chorus for a performance of Mozart’s “Magic Flute.” He said yes, and so we started learning the music. Friday afternoon, I got off school, picked up a friend and rushed downtown. 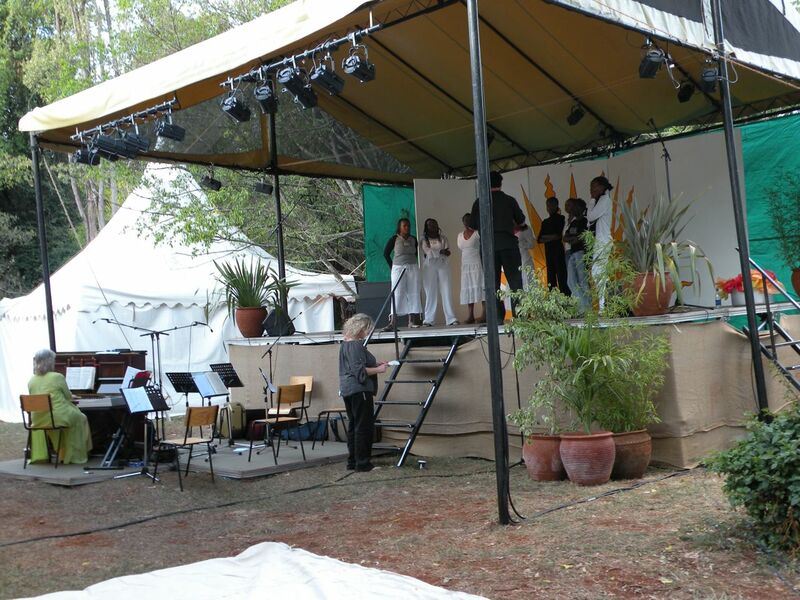 The “stage” was a raised 15’x15′ covered platform with a simple sun painted on the backdrop and potted plants along the sides and corners. It faced into a long tent which had seating for about 300 people. The orchestra was a tiny chamber ensemble: piano, violin, viola, cello and flute. 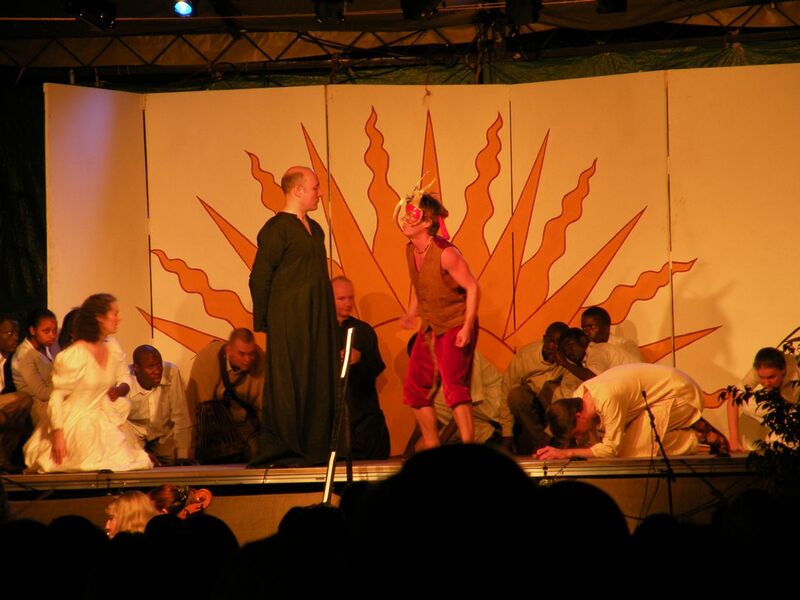 Once most of the chorus had arrived, the energetic director and his wife gave us our directions: “Be a part of the action – feel free to go on stage and interact with the performers or just engage with the action on stage. Stay around the base of the stage and try to stay in character.” Once again I’m thinking WHAT?? oh man .. okay ... here goes nothin’. The sun set, the overture began, and we were off! I danced about on stage and among the potted plants, I peeked over the edge of the stage when the characters were deliberating, I ran away from the Queen of the Night, and I bowed to the high priest. Not having previously sung any of the chorus parts with any kind of instrumentation, I tried not to look too surprised when suddenly the chorus burst into song and I realized I was meant to be singing. Where’s Lillis? A humble slave in the corner … trying to bow and still follow the action. I think it was the most light-hearted and fun approach to opera I have ever seen. I’m not quite sure I could give you the complete story-line for Magic Flute, but I had a good time making stuff up as it unfolded. Hey! We are learning all about the Magic Flute. It is very confusing and frankly, bizarre.